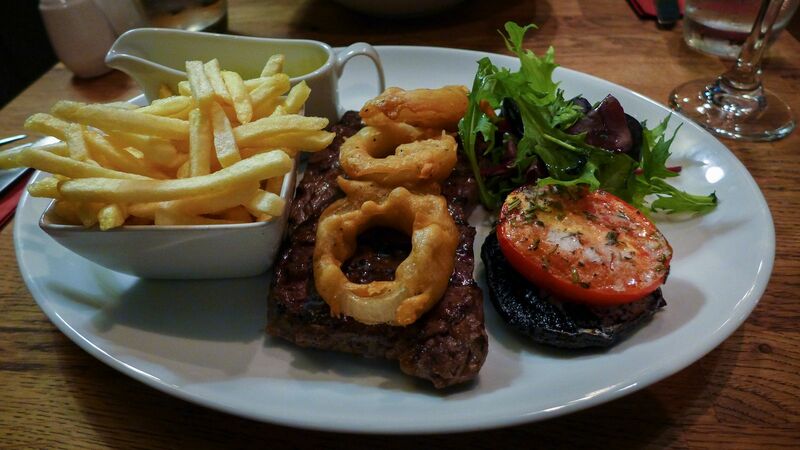 You love steak! You want steak! You crave for steak! 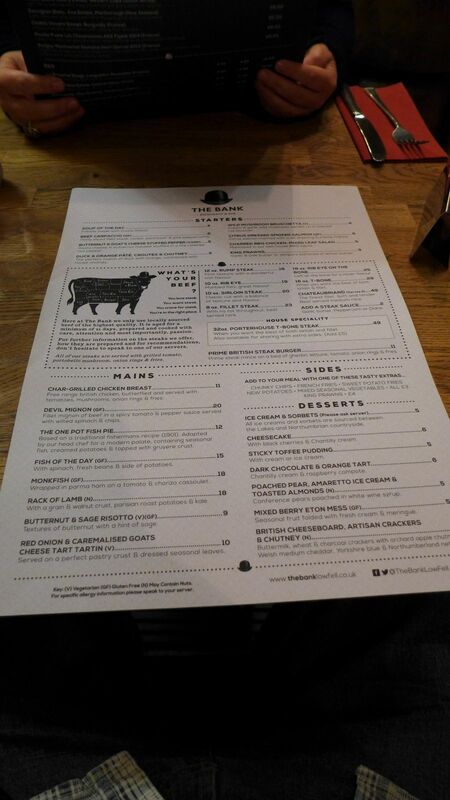 So, slightly creepily, read the menu, making it less like a list of things to choose for dinner and more like a brainwashing session from an evil butcher. Normally I’d prefer not to be hectored by inanimate pieces of card, but in this case, the menu actually seemed to know my mind. I ordered the rib eye. 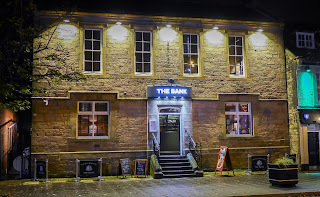 In case some of you have a feeling of déjà vu: yes, I reviewed The Bank Bar & Bistro in Low Fell just over a year ago. 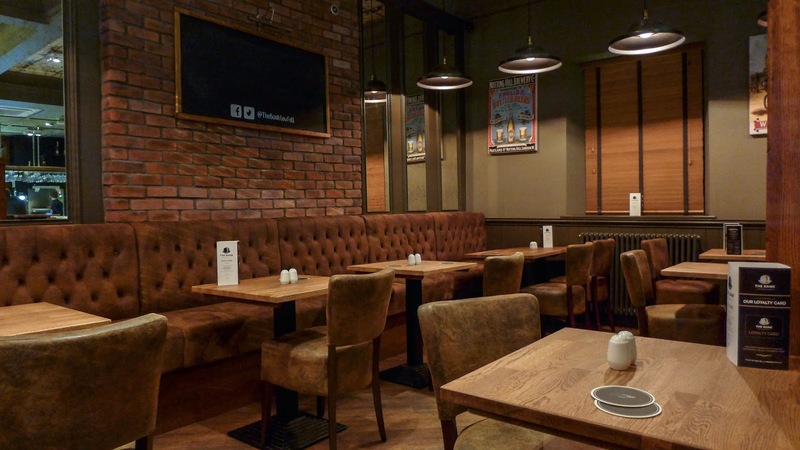 It’s an unflattering review that still generates comments on my website, largely because it describes my encounter with the rudest waiter in the North East, who was more concerned about the fact that I was wearing trainers than offering me decent customer service. Or a decent meal: the food was pretty indifferent too. Mrs Diner and I returned because The Bank has come back from the grave (it didn’t survive long after the last review). Kevin Brown, the original owner, is back in charge, having sold the business in 2014 and then watched it fail. Lee Walker, who was head chef when The Bank first opened, is back behind the stoves. It's now "Bar and Restaurant", rather than "Bar and Bistro"; the website is new and shiny, so is the menu (seasonal and locally sourced, natch) and I’ve spotted much online twittering about some exceptionally frothy ‘reviews’ by local bloggers who seemed to have enjoyed the free food and wine the restaurant gave them all a few weeks back. It sounded as if, like some latter-day Alan Partridge, The Bank has bounced back. So, sporting a rather fetching pair of blue suede Adedas Superstars, I took Mrs Diner back to Low Fell to see what all the fuss was about. We paid for our own meal, of course. We were seated in the downstairs bar, which, with its bare bricks, bare wood tables and leatherette banquettes, is a study in brown. The smart upstairs restaurant is now being used only when required, which makes sense as we’d have been lonely up there; there were few customers, and most were in for drinks. 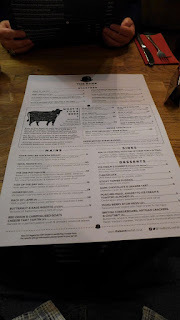 It was a good selection of drinks too, with a couple of Wylam’s more interesting offerings on tap, and a good range of bottled beers. 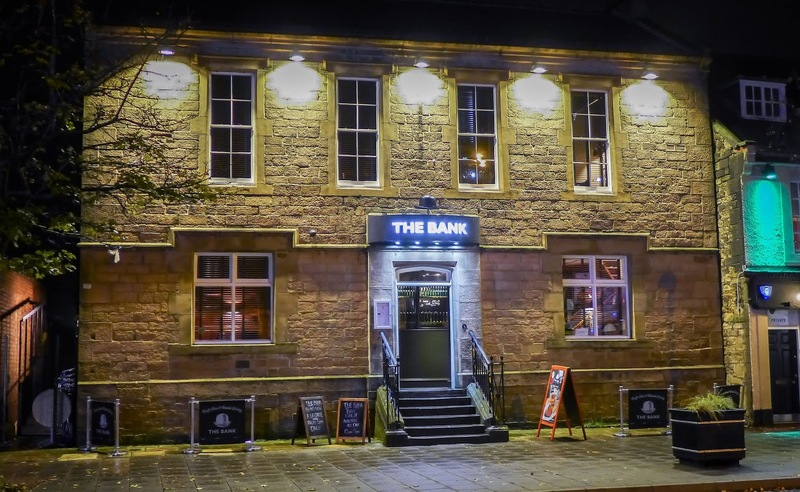 Corney and Barrow have been chosen to supply The Bank’s wine list, from which the elegantly poised Heywood Estate Australian Shiraz would have made a good value companion for a fine steak. Well, a better steak than the one I was served. 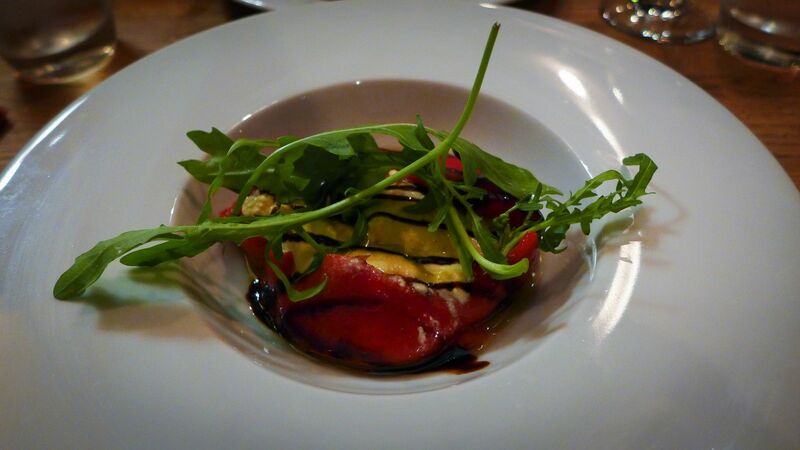 As it happens our dinner was a bit of a puzzle: some was quite good, some really not so much. The good bits mostly found their way onto Mrs Diner’s plate. 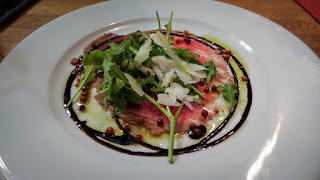 Her wisp-thin slices of beef carpaccio had a nice clean irony flavour, aided by the punch of a pink peppercorn dressing, although rather less so by some underachieving parmesan. There wasn’t a great deal of the beef, but in fairness £6 doesn’t buy you an awful lot of fillet. For my own starter, I eschewed the ubiquitous tempura prawns and charred BBQ chicken and went for something more original: roasted red pepper stuffed with butternut and goat’s cheese mousse. The latter had an odd texture, at once granular and claggy, which I found strangely compelling if not exactly pleasant. There was a decent thump of goat’s cheese flavour, but being served fridge-cold didn’t help it at all. 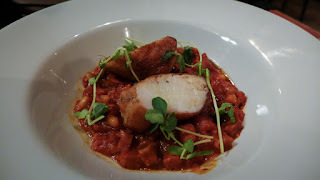 The star performer was Mrs Diner’s nicely cooked piece of monkfish in a jacket of parma ham, sitting on a stew of good quality chorizo and tomatoes, which had a tangy freshness – perhaps a little too fresh for a stew, but very pleasant nonetheless. Which brings us to that steak I was apparently so craving. The Bank offers several cuts at the heart of its menu, including a chateaubriand for two at £49. There was even a picture of a cow, staring at me and asking What’s Your Beef? Well, my beef is that my rib eye arrived with criss-cross grill lines. These might look pretty, but they do nothing for the flavour. I like all my steak’s surface to have made contact with the heat so it develops that delicious ‘maillard’ reaction that makes good beef taste great. If the bulk of the meat is raised up, it can end up tasting a bit stewed. As this one did. It was also rather tough, even though the menu claimed it was 21 day aged. This means nothing at all because it could have been dry aged (good) or wet aged (not so good). I suspect the latter. Skinny fries were crisp and seasoned, but the batter on the onion rings was chewy. The peppercorn sauce was an unstable-looking emulsion of a lot of dairy with an unpleasant synthetic sour tang. I pointed this out to the waitress who, after checking, confirmed there was no lemon in the sauce and helpfully suggested that I might have had the flavour of a slice of lemon from my water on my palate. An acidic mystery. Even the most average meal can be salvaged by an exceptional dessert. Here the opposite happened: a chocolate tart sported a depressingly flaccid pastry that should have been ashamed to call itself a crust, while a poached pear had emerged from a bath of syrup that needed the lift of star anise, the warmth of cinnamon, or anything at all really to make it interesting. I would honestly have loved to be able to spin you a tale of how the food in this old listed Lloyds Bank building has transformed and now matches its classy surroundings, but the last thing any of us needs is another mis-selling scandal on our hands. However they certainly didn’t seem to mind my trainers.